Central Hillsboro community center has been in works for years, and is expected to open in 2021. A years-long plan to build a two-story community center in central Hillsboro is moving forward, after city officials approved a contract with a local architecture firm last week. 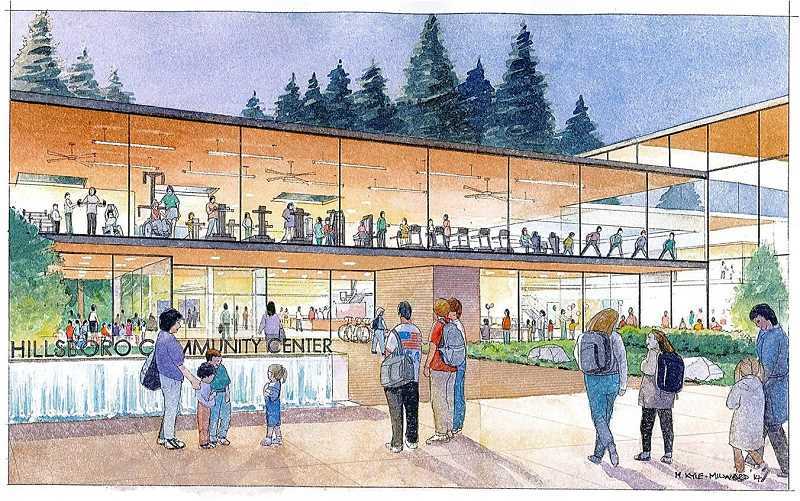 The Hillsboro City Council approved a $3.5 million contract with Portland-based Opsis Architecture on Tuesday, Feb. 20, to design the city's second recreation center, planned for property near 53rd Avenue Community Park, near Baseline Street. When built, the $35 million community center would be the largest Parks & Recreation project in the city's history, according to city spokesman Patrick Preston. What the building will look like is still being worked out, but initial proposals for the property call for a two-story-tall, 91,000-square-foot building complete with two gymnasiums, a raised track, workout rooms, classrooms and a 300-seat community meeting space. The City Council's decision last week allows architects to begin designing the community center. The building would be double the size of the city's other community center, the Shute Park Aquatic and Recreation Center near downtown. 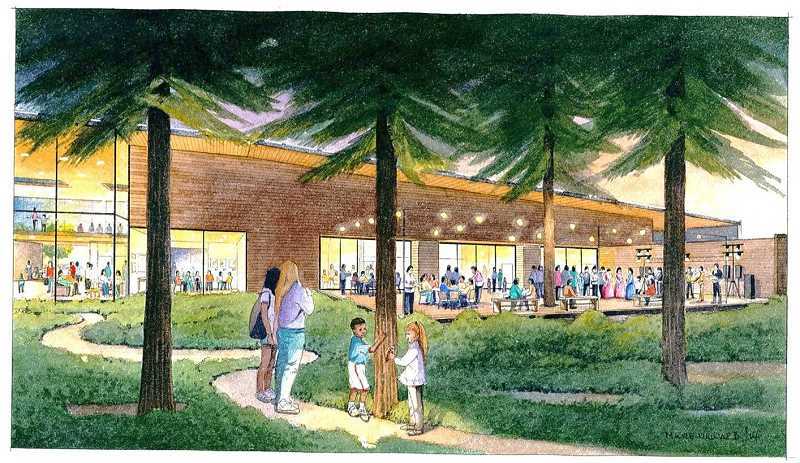 Mary Loftin, a spokeswoman with the Hillsboro's Parks & Recreation Department, said work on the proposed community center started more than a decade ago, years before 53rd Avenue Community Park was opened to the public. "It's been a 12-year process from when we first started talking about this," said Dave Miletich, the city's parks and recreation director. "Last Tuesday was certainly a milestone." In 2008, voters shot down a $44.5 million bond measure that would have paid for the community center and improved more than a half-dozen parks around the city. Since then, the city has refined the project, Loftin said. The new community center will be built with public funds, rather than a capitol construction bond. The project has been a listed priority by the Hillsboro City Council for some time, Loftin said, but other projects have drawn the city's attention, until now. "There have been a lot of project to consider as the city grows," Loftin said. "Not is the time for the community center at 53rd, and we're really happy about it." The community center would be built on 20 acres of empty property the city maintains across from popular 53rd Avenue Community Park, 300 N.E. 53rd Ave.
"The city has grown significantly over the last few decades, and we're trying to provide the recreation amenities the community needs," Miletich said. "There is a greater need overall than what they city can currently provide." Much of that growth has pushed the city eastward, with many of the city's residents now living a few miles from Hillsboro's historic downtown. The new community center is meant to draw visitors from across the city, Miletich said. "The location at 53rd Avenue is very central to the entire city," Miletich said. "It's as close to a bullseye as you can find to the center of town ... This facility was definitely designed to serve as a community center for everybody that lives in Hillsboro. Whether you live on the east, west north or south, you should be able to get there within 10 to 15 minutes." Miletich said the community center offers something the city has never been able to bring to residents before. "The city doesn't own a gymnasium," Miletich said. "This will be the first gym facility for the city of Hillsboro, and it will be used from early in the morning to late at night for a wide variety of sports programs, fitness classes and miscellaneous activities." Plans also call for walking and biking trails around the community center, as well as playground equipment for children. The city will be able to host new types of events in the space, Miletich said, including futsal and pickleball tournaments. "We want this to be a gathering space for everyone," he said. "In the mornings we'll have activities for seniors, and after-school hours that same space can be a place teens will utilize. This is a true community center. We're designing it for everybody and programming it for everybody." The center is expected to break ground in 2019, Loftin said, and could open as early as 2021.